This is a movie DVRd off of Turner Classics for its description. The idea is that a boxer talks to his wife about his life before going into a boxing match he is supposed to throw. If the premise sounds interesting, it feels an awful lot like the Bruce Willis thread in PULP FICTION. While THE SET-UP is, itself, a sort of pulp fiction, it is safe to say that Tarantino did not lift or pay homage to this movie directly in his film. It would seem, however, he may have seen it in determining the tone of his characters for that segment. Now, on to the ranking. I watched THE SET-UP (1949) on 11.11.13. It was my first viewing of the film. 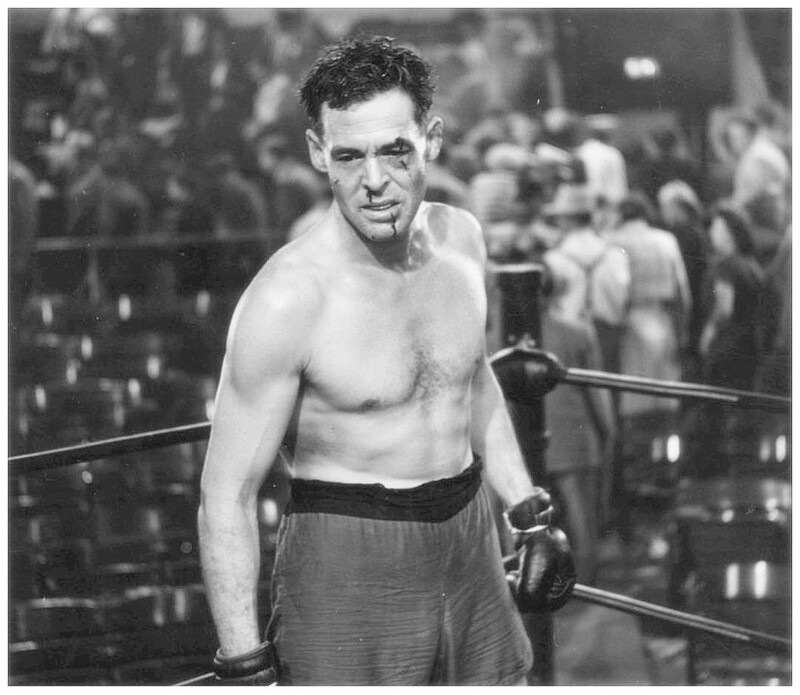 Stoker (Robert Ryan) is supposed to throw his next boxing match. Only he doesn’t know it. He doesn’t know it because his manager Tiny (George Tobias) figures Stoker is a terrible enough boxer that he doesn’t even need to tell him. In Tiny’s mind, telling Stoker would mean having to pay Stoker. Instead, Tiny just goes in assuming he will lose. When we first meet Stoker he is arguing with his wife, Julie (Audrey Totter), in a hotel room across the street from the ring. She says he, at 35, is well over the hill for a boxer. They talk about his failing memory and unfulfilled dreams. She tells him not to fight. He tells her that he is feeling it. He’s just a punch away from success. He crosses the street to fight. Part of the beautiful simplicity of this film has to do with the setting. Everything happens in a one block radius. We can see the hotel room Julie is in from Stoker’s dressing room. When she later wanders the city she stretches the setting. But otherwise, the camera moves freely around the space, not having to cut location very often. It makes for a concise and streamlined feature which occurs in real time (though with more than a little cheating). This is billed as film noir, though IMDB seems to have it wrong here. This is really anti-noir or post-noir. There is no femme fatale to speak of. Stoker is not an anti-hero, but rather someone to root for. The criminals are clearly bad and the hero is most certainly not in league with them. It feels as though the world is all against him, rather than a Bogart type using the seedy world to his advantage. Even the lighting, shadowy as it is at points, is not noir. The boxing match itself is perfectly lit. A moment after the match has Stoker walking down an alley. A light shines through a grate leaving strips of shadow on the wall. We know what this means. 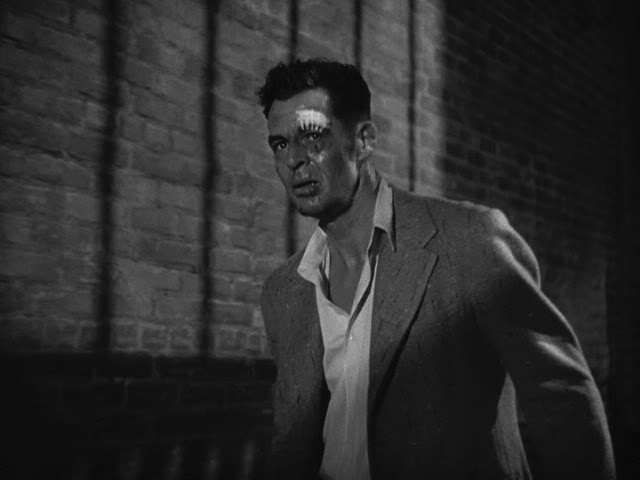 Characters being crossed by vertical bar shadows is an old noir trope used to signify an imprisoned character, either figuratively or as a means of foreshadowing a literal imprisonment. Only, when Stoker crosses this path he walks in front of the bars. The shadows don’t cross his face. This serves to show Stoker’s freedom and absolute correctness. The script seems to be at odds with the filming at times. This is a credit to director Robert Wise, who would go on to direct such major films as THE DAY THE EARTH STOOD STILL, WEST SIDE STORY and THE SOUND OF MUSIC. His direction belies the noir-ness of the script. Things may not go so well for Stoker at the end, but the film-making suggest that he is above it, freed by it. The movie uses character extremely well. Stoker spends much time in the dressing room with other fighters. The eras of his life are represented. There is the fresh faced kid puking in the bathroom before his first fight. There is the young stud who says the same exact things Stoker does “I’m feeling it” and “I’m just one punch away”. Only this buck is strong and fast enough to back these words up. There is also the old man past his prime, something Stoker is seemingly weeks away from becoming. He leaves the dressing room optimistic and returns beaten and nearly dead. Which will Stoker be? That’s what the fight is about. The fight also contains characters of its own. The audience of a boxing match is mocked by Wise here. The people we keep cutting to include a middle aged woman who screams for the fighters despite saying she hates the fights. We have the gamblers who can’t help themselves and the career criminals who know how the match is supposed to end. We have the fat guy who is eating something different every time we see him, as he devours both food and violence. It’s all very cutting, very abrasive in its attitude towards boxing. And that pessimism is something this movie plays on. In the opening wanderings we see people being pushed aside, we see two different people losing at a claw machine, we see people failing to do things. This is where Stoker is in life: surrounded by failure. Boxing is portrayed as a brutal and thankless endeavor. The people who watch it are detestable and the people doing it are more like cab drivers than gladiators. For a movie about boxing, it is fascinating to see how much this movie seems to hate the idea boxing. All this is to say that Wise makes this little B movie so much better than it has any right to be. This is a surprisingly excellent film, which constantly surprises. I was sure I knew a couple of twists at the end only to be wrong. Any movie which sits at 64 years old and still has the ability to surprise is a winner in my book. ~ by johnlink00 on November 11, 2013. Very interesting. I hadn’t even heard of this, but your review is positive enough that I might just seek it out at some point. Great work! Thanks! Absolutely worth seeking out!